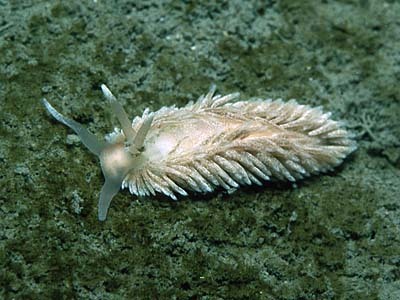 Description: The body of this nudibranch is orange brown in colour with extensive fawn or light brown surface pigment on the dorsum and in a rim around the edge of the foot. The cerata are covered with dense flecks of fawn coloured pigment. The outer half of the oral tentacles and rhinophores are similarly pigmented. Habitat: Typically a sublittoral species, but occasionally found on the lower shore. This species feeds on Sagartiid anemones, especially Sagartiogeton lacerata. This anemone is usually found in sheltered muddy sites attached to pieces of shell or small stones embedded in mud. The spawn is a smoothly coiled thread with distinct breaks at regular intervals. Distribution: Widely distributed around the British coasts, in muddy inlets such as Strangford Lough, but also on exposed rocky coasts. Scarce and usually found in small numbers. Rhinophores and oral tentacles with outer portion pigmented. Picton, B.E. & Morrow, C.C. (2016). Aeolidiella glauca (Alder & Hancock, 1845). [In] Encyclopedia of Marine Life of Britain and Ireland.